The original firm from which E Gill & Sons Ltd is descended dates back to the mid-eighteen hundreds, this being a firm of joiners and undertakers. In 1915 the business was transferred from Mr G E Dobney to his employee Mr Edwin Gill. In 1930 Mr Edwin J Gill son of Edwin became the principal of the firm now called E Gill & Sons and guided it through the difficult times of the 1930’s Great Depression. In the early 1950’s Mr Edwin J Gill was joined by his two sons John and Peter. In 1958 the firm acquired premises on the north corner of Albert Street and Southend Avenue so that a hardware and garden shop could be opened because of the increase in do-it-yourself. Within twelve months the firm was notified that it would have to leave its joinery workshop on Albert Street (where the Co-op is now situated). Fortunately Mr Edwin J Gill had previously had the foresight to purchase a piece of land adjoining, where it was decided to erect a new building to accommodate the hardware shop, joinery workshop and funeral office. These new premises were opened in 1961. The present Offices and Chapel of Rest on the south corner of Albert Street and Southend Avenue were opened in 1979 after careful consideration to the needs of bereaved families. In 1990 these premises were extensively extended and upgraded. The premises now consist of a Service Chapel, three Private Chapels, Interview Office and General Office. The hardware and garden shop which was extended when the present chapel of rest was opened in 1979 was closed in 2003 and is now used as the showroom and offices for E Gill & Sons (Memorials) Ltd, Monumental Masons. 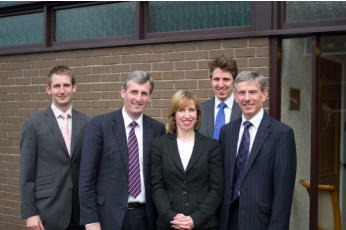 The firm is now run by the fourth generation David, Simon and Emma-Jane under the watchful eye of their father and mother, Peter and Janet. The fifth generation has now joined the business with David’s son Ian and Simon’s son Nick adding to the family involvement. David’s eldest son Mark works for E Gill & Sons (Memorials) Ltd in the monumental masonry business. In 2005 it was decided to acquire the funeral business and Chapel of Rest at 10 High Street, Collingham following the retirement of David Tingle. The Gill family, together with their experienced staff have always aimed to provide the best service and facilities that only a privately owned independent family business can give.